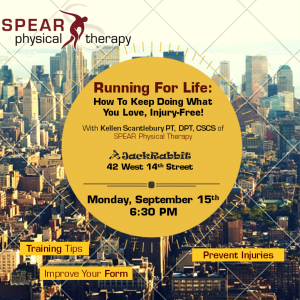 SPEAR's Kellen Scantlebury Shares Running Tips at JackRabbit Union Square! Kellen will be sharing his tips and expertise at JackRabbit’s Union Square Location! Make sure to stop by on September 15th at 6:30PM to learn how to stay on your feet, injury-free! Can’t make it to Kellen’s talk? Check out his Top 5 Running Tips!